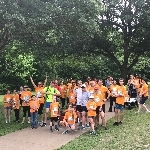 Walk, run, or push a stroller with us at the World Vision Global 6K for Water on April 27, 2019. Each registration provides lasting clean water to a child, like the child on your race bib! We will be serving chips, drinks, and hot dogs after the walk. It will be great time to enjoy friends and celebrate raising money for clean water.